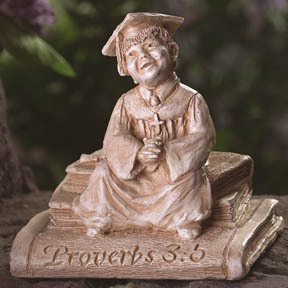 Proverbs 3:5 "Trust in the Lord with all your heart"-God's Word Collectibles—Inspirational gifts, cards and sculptures, a present with a scriptural message, a gift as a ministry. 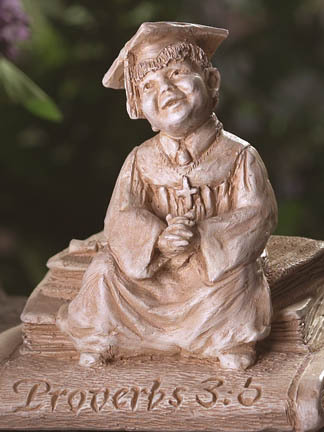 Home > God's Word Sculptures > Proverbs 3:5 "Trust in the Lord with all your heart"
I title this letter “student” because; I know that we will always be students in life. It was by request that I was asked to create a graduation piece. It was very appropriate for me at the time, for my daughter was graduating high school. There are many things I would like to be able to offer her as she continues on in life, completing one challenge and entering into a new one. But there are no words of wisdom, no trinket, nor honor that I could bestow to her that is greater than the words in Proverbs 3:5-6. Trust God, walk with Him, in everything acknowledge Him. Don’t lose sight of Him and be careful to not let the goal become more important than the Goal Giver. Don’t lean on your own understanding of things. Things are not always as we understand them to be. Learn to look at things through God’s eyes. It is true that on our journey we have many people that help us along the way, those who encourage us and those who have taken it upon themselves to pray to God on our behalf. There is no greater thank you to those same people than to see the graduate go forth, hand in hand, walking with God. Bless this graduate. The world is big and sometimes overwhelming. It is time that they spread their wings and use the gifts that You have given them, and walk with You, trusting. Be near in their travels and share the adventure with them. Make their paths straight and true, and pad their footsteps with Your precious love.